The Republican establishment finds itself on the verge of victory this Super Tuesday in its three high-profile contests against the Tea Party -- in Kentucky’s and Georgia’s Senate primaries, as well as in Idaho’s congressional primary. But it didn’t always look this way. Six months ago, there was the real possibility that Tea Party challenger Matt Bevin could have threatened Senate Minority Leader Mitch McConnell in Kentucky; that either conservative Reps. Paul Broun (R-GA) or Phil Gingrey (R-GA) could have topped the GOP field in Georgia instead of being stuck at the bottom; and that the Club for Growth and other conservative groups could have sunk Rep. Mike Simpson (R-ID). Yet unless the truly unexpected happens on this Super Tuesday Primary Day, those aren’t going to be the outcomes tonight. So why is the GOP establishment on the verge of victory today -- and maybe in next month’s primaries, too? We can point to three reasons. First, campaigns matter: The establishment candidates and their allies took the Tea Party challenges seriously and worked to disqualify their opponents. Example: The McConnell campaign seizing on Bevin showing up at a pro-cockfighting event. Second, the establishment essentially co-opted some of the Tea Party’s issues, so they couldn’t be accused of being squishy RINOs (see these ads by David Perdue and Jack Kingston in Georgia). And third, the Tea Party base just isn’t as fired up as it was a year ago. Remember when conservatives groups were outraged that Karl Rove’s American Crossroads said it would play in primaries to defeat far-right (and thus un-electable) candidates? Well, Crossroads and the U.S. Chamber of Commerce are freely endorsing and playing in GOP primaries -- and they’re doing so without any backlash. One of our other working theories why the conservative base isn’t as fired up as it used to be: The deficit has been decreasing, taking power away from arguably the Tea Party’s biggest initial rallying cry. Yes, we know the DEBT is still growing. But the perception with the vast majority of the public is that annual spending is “under control”; between government shutdowns, debt-ceiling standoffs and sequestration, there is action the public sees as attempts to slow the growth of government. Regarding that last point, it’s worth pointing out that today’s primaries in Georgia and Kentucky were always a potential hurdle for the GOP -- nominate the wrong candidate and possibly hand the Democrats a victory they shouldn’t have in November. (See Todd Akin and Richard Mourdock in 2012.) So if today’s primaries play out how we expect them to, Republicans will clear this hurdle. Still, as our NBC-Marist polls from last week showed, the GOP is going to have to fight to win in Georgia and Kentucky come November. 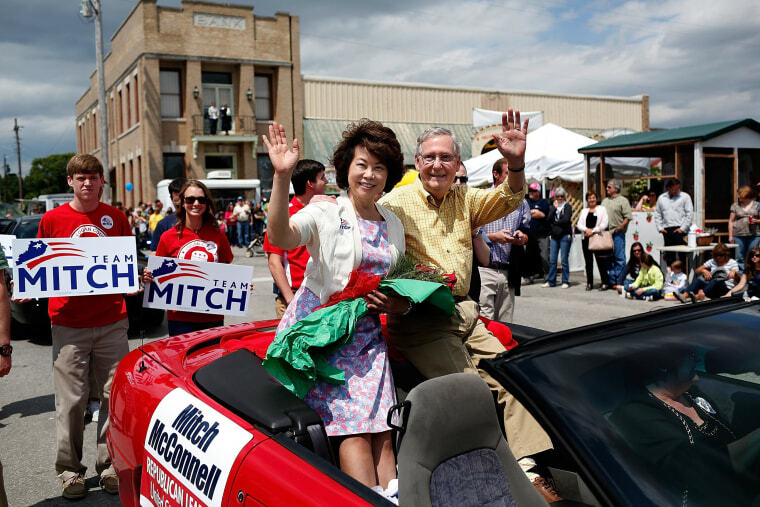 The polls showed McConnell (at 46%) and Democrat Alison Grimes (at 45%) locked in a dead heat among registered voters. And they showed Democrat Michelle Nunn running competitive among all of her potential GOP opponents. While picking up a net of six seats in a playing field featuring at least 10 vulnerable Dem-held Senate seats seems reasonable, the GOP’s chances of Senate control go down if they suddenly have to win seven or eight of those 10 Dem seats. So losing either Georgia or Kentucky -- or both -- raises that magic number for the GOP. While we’ve focused so much on today’s Republican primaries, Democrats have their own competitive one in Pennsylvania, where the candidates are vying for the right to challenge vulnerable incumbent Gov. Tom Corbett in the fall. The person who’s jumped out -- surprisingly -- to be the front-runner in this contest is businessman Tom Wolf. It’s a reminder that candidate style is always important: Wolf has come across in his TV ads as non-ideological and results-oriented. “I’m Tom Wolf, and I’ll be a different kind of governor,” he says in one of his ads. Of course, thanks to Wolf’s deep pockets, he’s been able to run A LOT of these ads to introduce himself. By comparison, Rep. Allyson Schwartz (D-PA) hasn’t run as good of a campaign. She went into this contest as the most recognizable name to D.C. types, but hasn’t been able to break through. Some folks may attempt to draw broader conclusions about her inability to catch fire, but it seems from the get-go, while she had some traction in DC, many Pennsylvania Dem types never totally bought into the idea she was electable statewide, and that slowed down her fundraising early. Meanwhile, in Oregon, there’s a new damaging report on Monica Wehby, the front-runner in Oregon’s Senate GOP primary. “The ex-husband of Republican Senate candidate Monica Wehby accused her of ‘ongoing harassment’ as they were going through a divorce in December 2007 and also called the police on her in December 2009 over a dispute about seeing their children, documents obtained by The Oregonian show.” This comes AFTER Politico last week reported that that an ex-boyfriend had accused Wehby of stalking him and harassing him in 2013. But here’s one thing to consider about these back-to-back damaging articles on Wehby: Oregon votes by mail, so it’s possible that many of the ballots had been returned BEFORE these stories surfaced. If Wehby wins tonight, it’s possible that these stories could be fodder for Democrats come the fall. Then again, a candidate must walk a very fine line if the idea is to paint a female opponent as violent or unstable, especially regarding domestic disputes. It could backfire, big time. Also on this Super Tuesday, don’t forget the potentially interesting House primaries. You have two ex-members -- Republican Bob Barr in Georgia and Democrat Marjorie Margoiles (who is Chelsea Clinton’s mother-in-law) in Pennsylvania -- trying to make a return to Congress. And also in Pennsylvania, House Transportation and Infrastructure Committee Chair Bill Shuster is getting a Tea Party challenge from Art Halvorson, though Shuster is expected to cruise to victory. (Does a big margin for Shuster open the door for a transportation bill to actually get through THIS Congress?) Final poll closing times in Georgia and Kentucky are at 7:00 pm ET; Pennsylvania’s polls close at 8:00 pm ET; Arkansas’ closes at 8:30 pm ET; and Idaho’s and Oregon’s close at 11:00 pm ET. The Mississippi primary is getting nasty, with both sides hurling accusations after an activist who backs Chris McDaniel was arrested for taking unauthorized photos of Thad Cochran’s bedridden wife. And on top of the who-knew-what-when game between the campaigns, there’s this too drama too between some of the outside groups playing in the race: The Tea Party Patriots Citizens Fund – which is backing McDaniel, is re-upping an existing FEC complaint, saying that a pro-Cochran PAC violated rules by deliberately failing to disclose where a $250,000 loan came from. Meanwhile, McDaniel is touting a Citizens United Political Victory Fund poll conducted by polling company, inc./Woman Trend that shows him leading just inside the margin of error -- 43 percent to 39 percent among likely primary voters.